Kite Fighting - North American Style! Perhaps you have heard of kite fighting, particularly in the context of Indian or Afghan flying. The latter was given a big publicity boost by the movie 'The Kite Runner' of course! As I have touched on in other pages on this site, some traditional Asian contests involve the cutting of your opponent's string with gulp ... ground glass pasted onto the line! But what about North America? Well, the sport has taken off there too. At first, it was mainly people copying the traditional types of fighting contests from Asia. However, a uniquely American kite fighting scene has developed since the late 1990s. The photo down there is courtesy of the AKA (American Kitefliers Association). The kites are generally quite small, around 18" in height. With the curved cross spar and roughly square Diamond shape, the Indian influence is clear! The kite sail often has 2 small battens attached near the tail end, defining a wedge-shaped area of sail. Bridles with more than the traditional 2 legs are common, for smoother flight characteristics. I must admit this took me by surprise, since I have always associated complex bridles with much larger kites. Modern materials predominate for both sails and spars, although split bamboo is sometimes used as well. A 'line-touch' concept is the basis for competition, rather than line-cutting! With these kites, the curved cross spar is often referred to as the bow and the vertical spar, the spine. Also, the sail is often referred to as the skin. Instability is the key to controlling these kites, so they don't have tails. Pulling on some line tension causes the kite to fly in a straight line. At other times, it tends to fly around in tight circles! 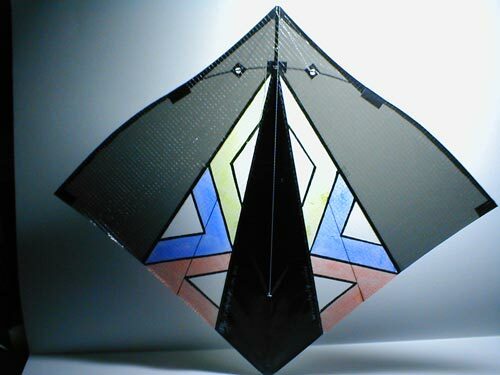 Here at MBK, the nearest thing we have to a fighter kite design is the Dowel Rokkaku. The Rokkaku was originally a Japanese fighting kite concept, where kites were downed with flying lines intact. 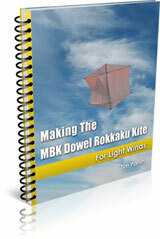 Making The Dowel Rokkaku Kite is one of my printable e-books. It's a PDF file download. Kite-fighting types like to think that their sport extends the flying to 3 dimensions. Well, I guess that's true when compared to sport kites. 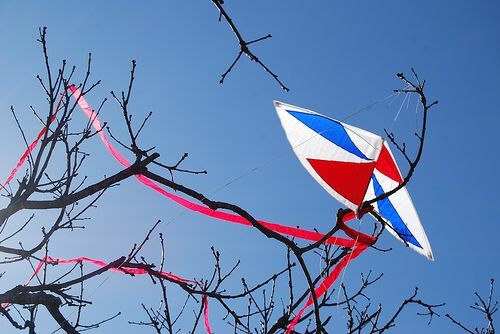 These kites are not really beginners projects, in the sense that they tend to use a variety of tools and techniques. Several hours of careful work is required to turn out a neatly and accurately made craft. Some designs make an attempt to simplify things for the beginner though, with a claimed build time of just 2 hours or so. It's certainly true that the smaller the kite, the harder it is to get the dimensions accurate enough. Not being a great craftsman, that's one reason why I prefer big kites! Of course there are online games now which simulate kite fighting! Just like practically every other sport on the planet. The increasingly popular 'line-touch' form of competition is a real contrast to the traditional line-cutting scenario. For one thing, all the action happens on relatively short lines. Compare this to the kids in India or Afghanistan who fly their kites so high and far away that they are almost dots in the sky! Thousands of feet of line go out. In a line-touch kite fighting, 2 competitors stand in 2 circles on the ground. When the call 'bottom' or 'top' is made, each flier attempts to touch his or her flying line with the other person's line. Supposing 'top' was called. In that case, the owner of the top line during the next touching of lines wins a point. The aim, of course, is to gain more points than your opponent. It's safer than lopping off birds' wings and people's ears with glass-coated line. OK, that's a slight exaggeration, but the wax-coated cotton lines these line-touch guys use is definitely safer! What better place to go than the North American Fighter Kite Association, if you want more info on the kite fighting scene there. That's their official site. The video below shows a complete kite fighting bout which took place at the Adelaide International Kite Festival. OK, so it's not North America. However, I'm sure a number of similar Rok Battles would take place in various events and festivals across the U.S. each year. At least the video shows some real non-traditional Western kite fighting. Even if the Rokkakus are painted with Japanese characters. Feel like making a Rok for yourself? Making The Dowel Rokkaku Kite is a printable e-book that I have published. It's a PDF file download. This Rok wasn't designed with kite fighting in mind, although I guess you could make a whole batch and have a light-wind stoush! That's right, this is an excellent single-liner to fly in light winds, just for fun. Any rising air in the vicinity will push this kite right overhead.